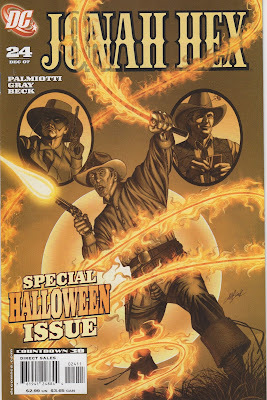 Jonah Hex V2 #24 "All Hallows Eve"
Two men are in full blown knock-down drag-out fight in a bar. One man is knocked out and a local official checks him out and announces the fallen man is dead. In the crowd observing is Jonah Hex and Bat Lash, discussing pugilism, with Bat explaining that only a trained fighter can withstand a beating from another fighter. Hex replies with, "Wanna bet?" and then sheds his shirt, but not his hat nor sidearms, to take on the winner, Bluett Boyd. The fight proceeds and ends up being a two-swing affair, with Boyd missing and Hex connecting resulting in Boyd kissing the floor. A young man runs into the saloon with a telegram for Jonah and he heads out, with Lash tailing behind, uninvited. Three weeks later: Hex and Lash are riding into Coffin Creek under cover of darkness. They ride up to the local brothel and Hex encounters the madam, Crystal Ray Adercrombie. Hex asks why she hasn't asked other gunmen to help her out and Crystal explains that Bill Bradley outta Kansas came and tried to oust this man from Crystal's establishment, with no effect. Hex, Lash, & Crystal head up to room 9 and right before Jonah heads inside to evict this unwelcome guest, Crystal tells him that Bradley, right before leaving town, said that the man in room specifically asked for Jonah Hex. In the room is none other than El Diablo and Jonah demands to know where Lazarus Lane is located. El Diablo unleashes his whip, wrapping it around Jonah's neck, bringing Jonah to his knees. Diablo states that the town is marked for death this All Hallow's Eve. Diablo has been imprisoned in the room so as not to interfere in the town's fate. A prairie witch by the name of Esmeralda Moorland lured Lazarus Lane away from Diablo and unless Lazarus and Diablo are reunited within three hours, Diablo will return to Hell and the entire town will die. Beams of unholy fire burst forth from Diablo's eyes, bathing Hex in fire. Hex steps from the room, his eyes glowing with fire and his voice twisted into that of Diablo. Hex tells Lash to follow him and they walk out into the street. We get to see the town through the eyes of Lash, everything looks normal, as well as through Hex's eyes, wherein everyone is a twisted misshapen demon. 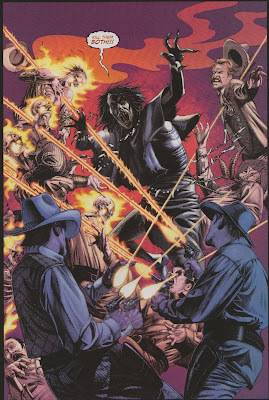 Walking up to the saloon, Hex demands two men produce Lazarus Lane and then he shoots both of them, rendering them both into flaming skeletons. Once inside the saloon, Lash sees Lane bound and gagged, hanging from lantern fixture in the ceiling. Everyone in the saloon, possessed by Esmeralda, is eating the raw remains of a freshly slaughtered bovine that is spread out across the bar. They all mutter the name of Hex. The witch commands that they all kill both Hex and Lash and the gunfight ensues. Hex's shots render the townsfolk into flaming skeletons while Lash's bullets produce only normal effects. Lash takes note of the fact and Jonah tosses a sidearm to Bat. The gun, while smoking hot from the fires of hell, only shoots regular bullets while being wielded by someone other than one possessed by Diablo. Jonah unleashes the whip and cuts Lane down, ordering Lash to take him back to the hotel. Bat is quick to comply. Jonah and Esmeralda fight it out in the bar while Bat Lash tries to make it back across the street, but all hell has broken out with townsfolk slaughtering each other in the street. Lash finds his way to the brothel barred by two men. He takes them out with a flourish of playing cards and a well placed boot tip and then dives through a window. Back in the saloon, Hex and the witch continue to battle when suddenly, with a burst of flame, El Diablo appears. Using his fire whip, he entraps the witch and liberates her head from her body. Bat lash enters the saloon saying that the town is returning to normal. Dawn the next morning finds Jonah and Bat in the company of Crystal and one of her ladies. Bat is recounting the time he saved Jonah. Finally, Jonah announces that he is hitting the hay and the lady goes upstairs with him. At the top of the stairs, Hex and his companion encounter Lazarus Lane, who thanks Jonah for his help. Grabbing Lane by the neck and driving a finger into his chest, Jonah replies with "Yer welcome." Bat Lash invites Lane to a hand or two of cards, but Lazarus states that he has overstayed his welcome in Coffin Creek and will be leaving soon. Men Killed by Jonah - We see 7 killed by Jonah, but there were probably more in the saloon. I'll stick with 7. Jonah's Injuries - Possessed by the devil himself. Timeline - Three weeks of travel and a night or two? Let's settle on 22 days and this one takes place after "An Eye for an Eye". I wasn't a big fan of this one. I really enjoy Bat Lash, especially with Hex, but I have always have (and always WILL) enjoy Jonah outside of the regular DC Universe with all of its supernatural and superheroic trappings. Lazarus Lane is an interesting character when handled by J and J, but Diablo doesn't fit into my vision of Hex's world. And Beck's artwork just doesn't do it for me, something is always slightly 'off', it tries too hard to be photographic. It looks traced, maybe? Oh well, make of it what you will. Next Issue: We teeter on the brink of the turn of the century and get a surprise visit from the past.